Freshman Taylor Kissinger led three Huskers in double figures with a game-high 18 points to help shoot Nebraska to an 80-60 women’s basketball win over UMKC at Pinnacle Bank Arena on Tuesday night. Fellow Nebraskan Maddie Simon added 11 points while matching her career high for the second straight game with eight rebounds. Simon (Lincoln) and Kissinger (Minden) teamed up on a 10-0 run in less than a minute to open the second half to help take control of the game after carrying a 38-35 lead over the Kangaroos at halftime. With the victory, Nebraska improved to 2-0 while UMKC slipped to 0-2 with its second straight road loss. Kissinger and Simon both hit three-pointers to open the second half, sandwiched around a pair of Simon transition layups to give the Big Red a 48-35 edge. As a team, the Huskers buried 6-of-10 three-pointers in the third quarter after UMKC went 6-for-10 from long range in the first half. Sophomore Grace Mitchell (Wellington, Kan.) added a career-high 10 points off the bench to give Nebraska three players in double figures in a true team win. All 10 Huskers scored at least two points and grabbed at least two rebounds in the victory. Senior guard Emily Wood (Salina, Kan.) tied her career highs with nine points and three three-pointers, while sophomore guard Hannah Whitish (Barneveld, Wis.) contributed eight points, five rebounds and a career-high-matching nine assists. Whitish has opened the season with 14 assists and no turnovers through two games. Cincore also scored eight points, including 2-of-3 three-point shooting, while adding a game-high four steals to go along with three assists. Freshman Kate Cain also managed eight points to go along with two rebounds, two blocks and an assist in her first career start. As a team, Nebraska hit 50 percent (32-64) of its shots from the field, including 12-of-28 three-pointers (.429). The Huskers also outrebounded UMKC, 42-33, and won the turnover battle, 15-14. NU limited UMKC to just 32.1 percent (18-56) shooting for the game, including less than 20 percent in the second half. The Roos went 6-for-10 from three-point range in the first half, but just 2-for-11 from long range in the second half. Aries Washington led UMKC with 16 points, while Omahan Samantha Waldron added 14 points, including four three-pointers. Kristen Moore contributed a double-double with 13 points and a game-high 11 rebounds. 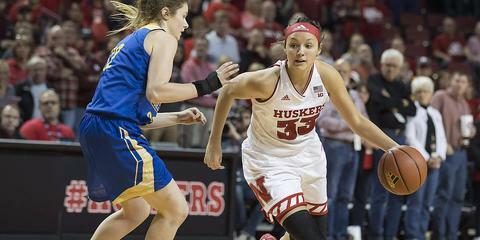 Kissinger led the Huskers with 13 points in the first half, including 3-of-7 three-pointers. All three of those threes came in the second quarter to help Nebraska take a 38-35 lead to the locker room at halftime. Nebraska received contributions from up and down the lineup, as Cain pitched in six points on 3-of-5 first-half shooting, while Whitish pitched in five points, including a three, while adding three rebounds and four assists. Stallworth added four points off the bench, as did Mitchell. Rachel Blackburn, Simon and Cincore each scored two first-half points, as eight Huskers found the scoring column in the first 20 minutes. Nebraska hit 44.7 percent (17-38) of its first-half shots, including 4-of-14 threes, but couldn’t shake the hot-shooting Roos in the first half. UMKC connected on 6-of-10 threes in the first half, from four players who combined to hit 26 percent of their threes a season ago. Waldron led the Roos with 11 points, including 3-of-6 shooting from three-point range. Overall, the Roos hit 43.3 percent (13-30) of their shots, but Nebraska outrebounded UMKC 23-17 in the half, but the Roos won the first-half turnover battle, 6-4. Nebraska’s biggest first-half lead came with a 20-13 edge at the end of the first quarter, when then Huskers closed the quarter on a 16-5 surge. The Huskers continue their four-game season-opening home stand on Thursday when they battle Arkansas. Tip-off between the Big Red and the Razorbacks is set for 8 p.m. with tickets on sale now at Huskers.com.